In Romans 1:11-12, Paul tells the Romans, “For I long to see you, that I may impart to you some spiritual gift to strengthen you – that is, that we may be mutually encouraged by each other’s faith, both yours and mine.” Over the summer we have been studying Romans as we’ve geared up to launch an RMG. In the first few verses of the book, I’ve been so encouraged by who Paul is and his attitude toward ministry. I thought it is so appropriate and applicable to us as a church as we start the new school and ministry year. 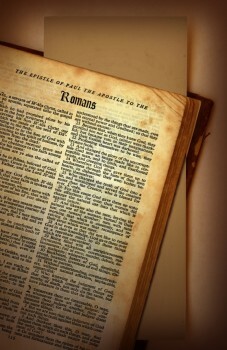 We see Paul’s heart as he expresses his longing to be with the Romans to encourage them and to be encouraged. I love how Paul’s humility is truly demonstrated. He had a much greater knowledge of Scripture, was a gifted apostle and had truth revealed to himself directly from God, yet he says he is eager to be encouraged by the Romans and doesn’t think that he already knows everything that they have to offer. He approached them with a humble attitude and was ready to learn and be fortified by them. Shouldn’t this be our heart too as we gather each week in our various ministries? He goes on to explain the spiritual gifts. All believers have been gifted in unique ways, therefore we can all have something to contribute or encourage someone with. I admit that I can often feel intimidated by someone older or more knowledgeable in the Bible and think that nothing I say will be anything that they haven’t heard before. That is sin, though, since I am fearing man instead of God. Whether we are young or old, immature or mature, knowledgeable or a brand new Christian, as Christ is daily sanctifying us, we can all be used by God to exhort another brother or sister. Let’s imitate Paul’s humility and long to be mutually encouraged by each other in each ministry that we serve in this year!